Hi there! Yesterday I was in a hop celebrating Jamie's 1 year Blogiversary!! It was so fun to see all the purple themed projects! I kept going with the purple theme for my project today! 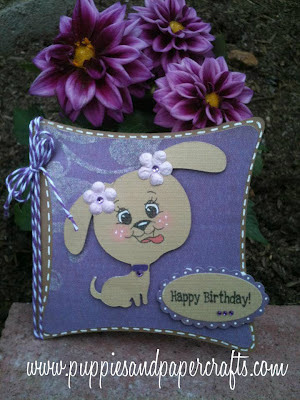 I made a birthday card using Purple, an Adorable Puppy and my Jaded Blossom Misc. Fun stamp set!! What a cute card Kim! I love the purple. That puppy is so cute with that sweet face and flowers...love it! Kim! !This is a Cutie Pie!!! !Love it! This is so adorable Kim!!!! So Cute. Just Love the PKS Face Adorable. This is so cute Kim. Love the face and the little flowers. This is just too darn cute! Really stands out too! Love it! super cute.love the dog and colors.